We’ve arrived in Broome, a tourist town on the north west coast renowned for it beautiful beaches and perfect winter climate, but mainly known as the source of the world’s most beautiful cultured pearls. We’ve scrubbed off the red dust, manicured, pedicured, pimped and preened to settle into a week or two of lazy days on the beach, eating out, retail therapy and exploring the local area. Managing our diet without large quantities of fresh fruit, vegetables and bread, our breakfast times had been limited to a choice between muesli or pancakes. This gave me the opportunity to perfect and embellish my gluten free buckwheat pancake recipe. We’ve enjoyed sweet corn pancakes, cheese pancakes, zucchini pancakes, blueberry pancakes and raspberry pancakes, but the banana version is the hands down favourite. Sift the flours, cinnamon and raising agents into a bowl. Make a well in the centre then add the eggs and milk. Using a wire whisk, mix to a smooth batter. Use more or less milk according to how thick you like your pancakes. Stir in the mashed banana. Heat a pancake pan and when hot add a little butter and swirl to coat the pan. Drop a large tablespoon of batter into pan and cook over a medium heat until the batter bubbles on the top. flip the pancake until the centre feels firm when touched. Continue to cook the desired number of pancakes. Sanwich the pancakes with a dollop of yoghurt, a few slices of banana and a sprinkle of chopped pecans. Top with the remaining yoghurt, banana and nuts then drizzle liberally with maple syrup. When I saw the photo of the pancakes, I thought you were back. Yummy pancakes! Aw, thanks Sam. You make everything look delicious! Those pancakes do look yummy! How did you manage to find maple syrup on the road? Left home with 5 bottles! Surprisingly the supermarkets in the larger country towns have the real deal on their shelves at city prices. Why thank you John, we’re all doing pretty well in the food department. Thanks Leah, have at look Snapseed for iPad, it’s a great little app and helpful for tweaking photos. 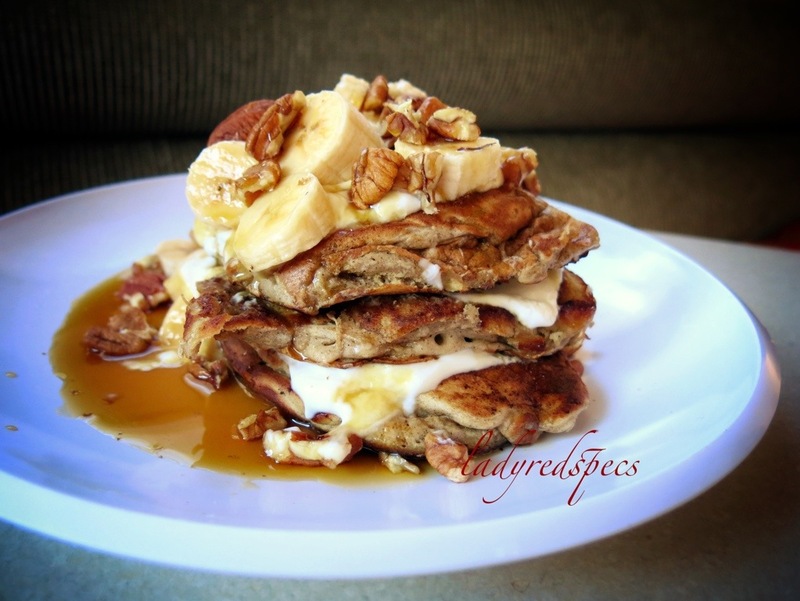 This entry was posted on July 31, 2013 by ladyredspecs in Breakfast and Brunch, FODMAP diet, Food, Fruit Desserts, Gluten Free and tagged FODMAP friendly, gluten free, lactose free, pancakes, sugar free.